In Republia ecosystem Rating system operates, which aims to exclude malevolent users, which try to harm, discriminate the system or prevent other users from making decisions in Republia life. When registering in the ecosystem, each user is provided with basic rating, which is equal to 45 points. This figure is a starting point for everybody and can vary upward or downward, depending on the participant actions inside the ecosystem. 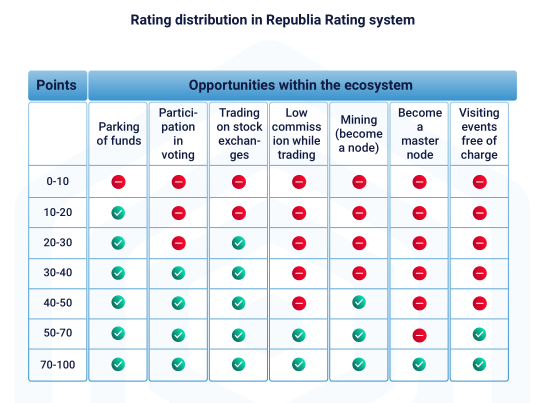 Participants with high rating are offered additional bonuses of the ecosystem, including the use of Parking tool, opportunity to trade on exchanges with a lower commision, visiting free meetups, organized by Republia Foundation, opportunity to become node or master node. After registration and obtaining 45 starting points, user is provided with an opportunity to increase his rating by 0.00789 points for each of the block mined and recorded correctly to Republia Blockchain. After using Parking tool, user’s rating also increases, in accordance with bonus system.